State police say Wilkin Tejeda bought the truck cab just before he crashed it on the turnpike in Ogunquit, escaping injury but snarling traffic for hours. 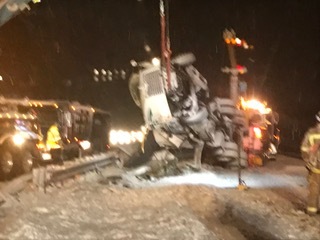 A truck driver who had just bought a new truck cab and was driving it back to his home in Massachusetts destroyed the vehicle late Wednesday afternoon when he crashed on the Maine Turnpike in Ogunquit. Southbound traffic was delayed for nearly three hours. State Trooper Anthony Keim identified the driver as Wilkin Tejeda, 30, of Lynn, Massachusetts. Tejeda was driving south around 4:20 p.m. when he lost control of the cab on the snowy road. Keim said the speed limit had been lowered to 45 mph at the time and Tejeda was likely going over the speed limit. His cab hit the guardrail and rolled over the top of it before the truck came to rest on its roof, Keim said. Two passers-by pulled him out. Tejeda was not injured, but the cab was destroyed. Tejeda is the owner and operator of WJ Transportation in Lynn.